Above: St Margaret’s Church before the First World War, with an entrance gate where the memorial now stands. 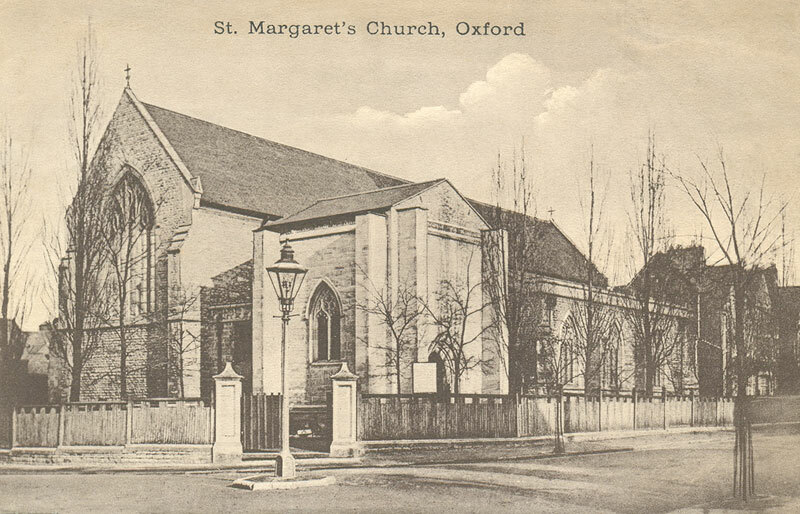 St Margaret’s Church was built in 1883–5 on the corner of St Margaret’s Road and Kingston Road as a chapel of ease to SS Philip & James, replacing a mission room in Hayfield Road. 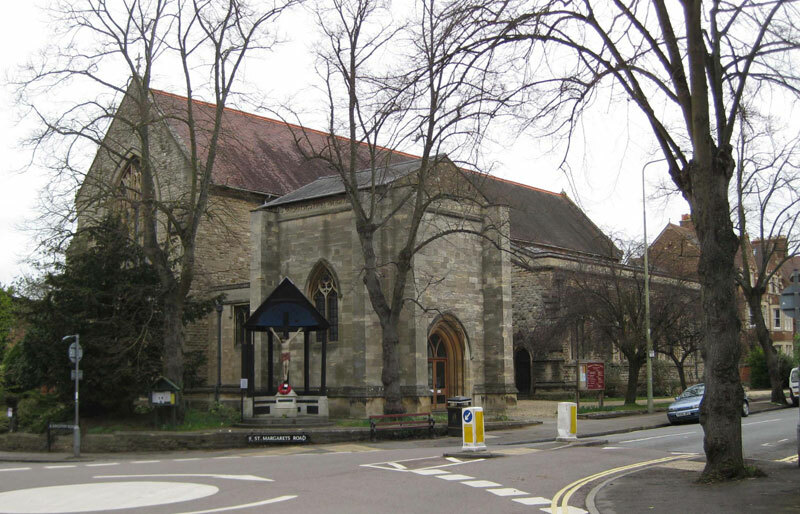 The huge development of north Oxford in Victorian times meant that SS Philip & James Church (built in the 1860s) was no longer big enough, and a new church capable of seating 500 people was required. The erection of the new Church of St. Margaret at the corner of Rackham-road, near Heyfield's Hut, is being rapidly proceeded with. It is designed in the late decorated style, and will seat, when completed, about 550 persons. It will consist of chancel, nave, north and south aisles, organ chamber, and vestries. The internal dimensions will be 112 feet from east to west, and 51 feet from north to south. The walls externally will be of coursed Gibraltar stone, with dressings of Box Ground stone, and internally plastered with dressings of Corsham stone. The chancel will be separated from the nave by an open tranceried oak screen, and an oak framed truss with the spandrils filled in with tracery, instead of a stone chancel arch. The roof will be of pitch pine, boarded, and panelled, and the nave, chancel, and organ chamber covered with Broseley tiles, and the aisles and vestry with lead. There will be a large porch at the west end of the Church, and a smaller one to the south aisle. The present contract is for the chancel, with a temporary nave, and will provide accommodation for about 190 persons. All seats will be free and unappropriated. Mr. H. G. Drinkwater is the architect, and Mr. Williams, of Abingdon, the builder. During the last year there has not been much done to complete this building, which was so sorely needed to relieve the over-crowding of the Mother Church. But what has been done is of great value, as giving some idea of the appearance which the interior will present, when the day of consecration arrives. The new work consists of two bays of the north aisle, and a temporary vestry at its east end. A considerable addition to the number of sittings has thus been provided. The east window of the Church has been filled with stained glass, by the liberality of the Rev. S. R. Wigram. All the painting of the glass was done by Mrs. Wigram and her family. In 1976 the parishes were united once more, and in 1982 St Margaret’s took over the parish of its former mother church when SS Philip & James Church closed down. In 1985 the benefice was united with that of St Giles. 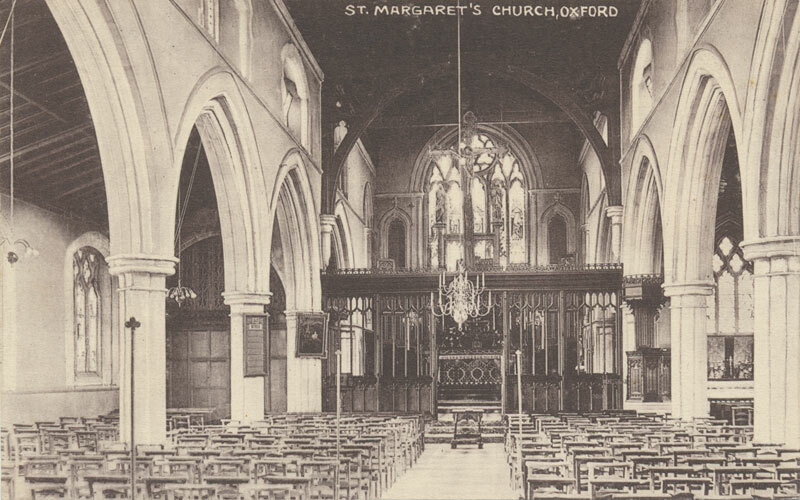 It is important to remember that St Margaret’s parish was in the Headington Registration District until 1932, and hence the births, marriages, and deaths of the people of this parish around the time of the First World War will be found under Headington, and not under Oxford. The reason is historic: the whole Summertown area was originally in the Manor of Headington and was taken into the Headington Registration District in 1837 when registration started.